Better Explorer Beta 1's new Conditional Select button combines filtered search with selection, allowing you to quickly highlight multiple files that meet criteria you specify. 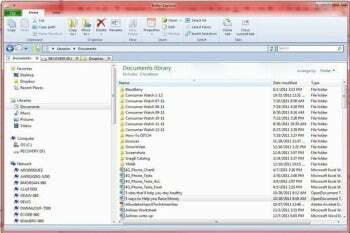 If you're eager to get a sense of what Windows Explorer will look like in Windows 8--or simply want a different and more powerful alternative to Windows 7's file management tool--consider this free project of the CodePlex open-source community. Running on Windows 7 (or the latest consumer preview of Windows 8), Beta 1 of Better Explorer seems to have resolved some of the buggy behavior users reported with earlier versions: I experienced none of the crashes I read about in user reviews. The most immediately visible difference between the current Windows Explorer and Better Explorer is the use of the ribbon interface. Like the current version, Better Explorer's menus are context-sensitive--they change depending on what you're looking at--and so is the ribbon itself. Certain file or folder selections produce tabs for special ribbons: For example, highlighting the Libraries folder summons a Libraries tab, and selecting an image brings up an Image Tools tab. Other special ribbons are available for folders, drives, and search (the latter appears when you click in the search box next to the location field). Less immediately apparent, but highly useful, is Better Explorer's ability to access multiple folders in tabs, eliminating the need to launch new Explorer windows when you want to see more than one file or folder at a time. Simply click New Tab (or Clone Tab to duplicate the current selection) on the far right of the Home ribbon. The ribbon, as usual, is particularly effective at exposing features hidden in traditional menus--but Better Explorer in some instances goes beyond the file management tools in Windows 7's Explorer by providing easy access to other Windows features. The Drive Tools ribbon, accessible when you click on a drive under Computer, has buttons for formatting, cleaning, and/or optimizing the drive--features found in the System Tools subfolder of Accessories. The Image Tools include buttons for rotating and flipping images, converting image files to one of five popular file formats, and setting an image as desktop wallpaper. One other major addition in Better Explorer Beta 1 is a Conditional Select button on the Home ribbon. This combines filtered search with selection, allowing you to quickly highlight multiple files that meet criteria you specify for name, size, date created, date modified, and last date accessed. Better Explorer is not without flaws. In some cases, I couldn't find features that are easy to access in Windows 7 Explorer--for example, I was unable to figure out how to view pictures in an image folder as a slideshow. The constant shifting of menus and ribbons based on context can be a bit confusing--for example, a Manage menu item seems to come and go--and a couple of the special ribbons have so few buttons that you wonder if they were really necessary. But the convenient access that it affords to many file management and other features make Better Explorer in many ways, well, better than its Microsoft cousin. Better Explorer (aka BExplorer) looks and behaves the way Windows Explorer will in Windows 8--except that it runs in Windows 7.